Getting There. Financial Crises Edition. Friend of the blog, Bill from the indispensable Calculated Risk, asked for an update on the financial crises comparison graph now that the U.S. has nearly regained all of the Great Recession’s lost jobs. The private sector is back but the public sector is still down considerably. Expectations are that the U.S. will be back to pre-recession levels in the next 2-3 months (although this leaves to the side the fact that the population has grown). 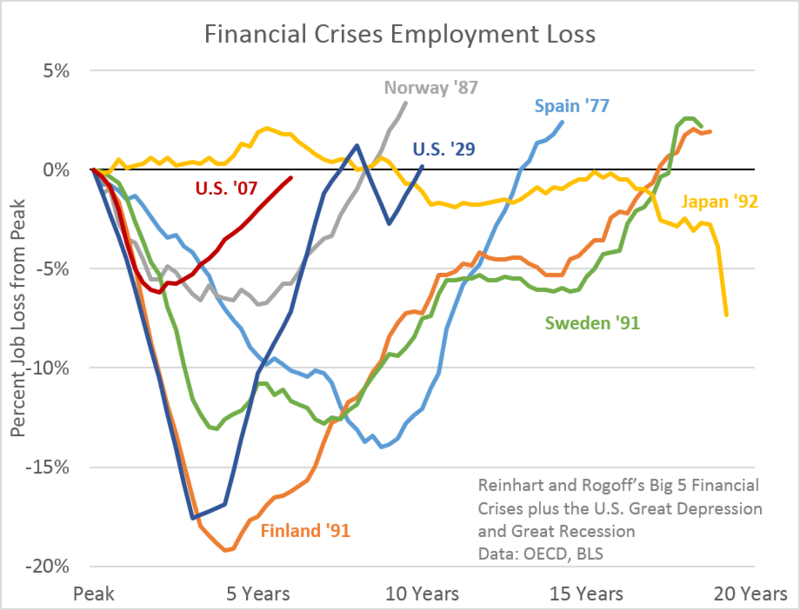 Just as a reminder the graph compares employment loss for Carmen Reinhart and Ken Rogoff’s so-called Big 5 financial crises with the U.S. Great Depression and Great Recession. Using Reinhart and Rogoff’s great work on historical financial crises, our office previously looked into comparing the Great Recession with these historical financial crises to see how the current cycle stacked up. Overall the Great Recession was your “garden-variety, severe financial crisis” as Rogoff once said, but in terms of employment, the U.S. has actually done fairly well when compared with these other, major crises. Not good enough overall to avoid mass unemployment and lackluster growth, but in the context of historical financial crises, the U.S. employment picture is better than most. The implications here are clear: Ben Bernanke is a wizard. Thanks for the chart Josh. Nice to see we are outperforming the Great Depression, but the 1992 Japan crisis is the one that concerns me. I think our current crisis has a lot in common with Japan’s crisis and I would argue we are not out of the woods yet. Thanks Pat. Japan is a concern and the increasing talk of secular stagnation is similar to that type of situation. However, two very important differences: positive inflation, albeit low, and falling… and real growth, not literal stagnation. If the secular stagnation argument proves correct, we’ll still be growing, just not at anything one might consider normal based on history. It’s the halfway position, in a way, between a typical recovery/expansion and truly being Japan.